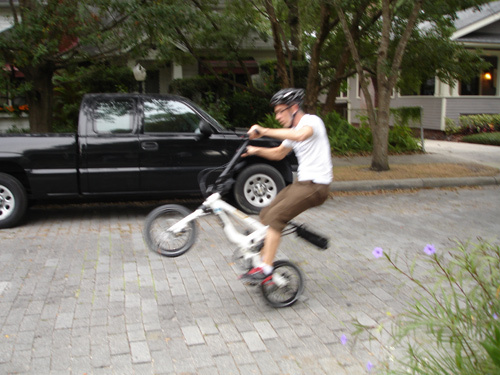 A couple of months ago, the folks from Jango Bikes loaned us one of their new folding bikes, the Flik V9, to test out. We previewed it here. 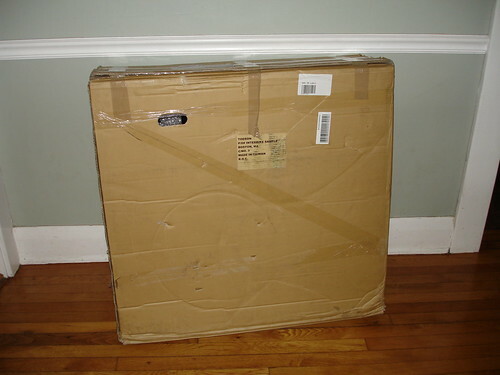 I’ve had a chance to ride it quite a bit — never got to try the true multimodal approach (bus/bike or bike/train) with it, but did pack it into the trunk of my wife’s car on days too rainy in the morning to brave the first half of my commute. Well, how did it perform? 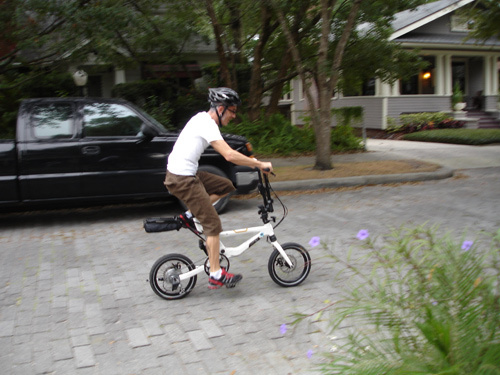 The bike itself is a blast to ride…I’ve always been enamored with folding bikes as they seem to bring a smile to my face whenever I get a chance to ride one. I found the gearing to be quite adequate for my commute — no real hills to tackle, but plenty of range with the 50T chainring and 11-34 9-speed cassette. There seems to be plenty of adjustability in the bike itself. While the handlebars don’t move up and down, the seatpost has plenty of range and the bike fit me fine. I think about 6 footers or so are the top limit for riders of this bike, however, and smaller folks will appreciate the bike even more. I’ve read a number of accounts from other folding bike users that it seems to take a lot of effort to spool up such small wheels as compared to a fullsize bike. I certainly didn’t notice that — the Flik gets up to speed effortlessly enough for urban riding. This is no race bike, to be sure, and isn’t designed to be blazing-fast. Overall the ride was smooth. One oddity I did notice was that sometimes as I was clipping along, I’d hit a bump and the rear shock would reverberate in time with my pedaling. I believe this is referred to as “pedal bob” in the mountain biking world. While it didn’t throw me off my game or really interfere with my forward progress, I found myself chanting “boingyboingyboingy!” in my head as I bobbed along. 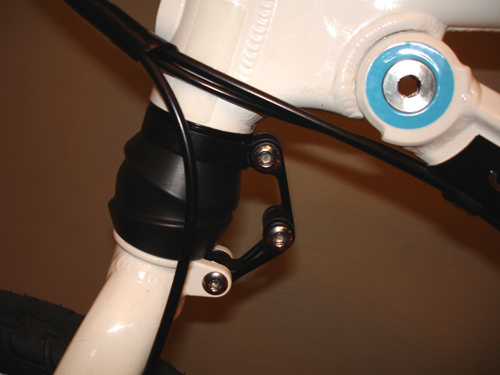 The rear shock is adjustable for preload with a knurled dial on the upper body of the shock, but even at its tightest setting, the bobbing was noticeable. The front and rear shocks do smooth out the roughness of road surfaces…I’ve long believed that suspension components are overkill for just about any commuter-friendly bike and add unneeded complexity and weight to the bike, but in many cases they DO serve to make things a bit more comfortable. 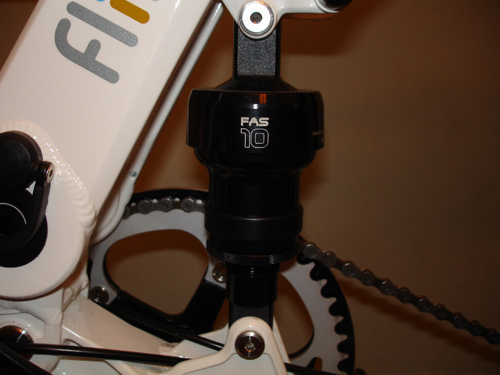 The spring-damped front shock (not adjustable) felt a bit clunky, as if the headset was loose. If I could, I’d specify the bike without these extras. The entire range of Flik models come equipped with the rear shock, but the front end of the 8-speed models (T8/V8/V8i) is rigid. 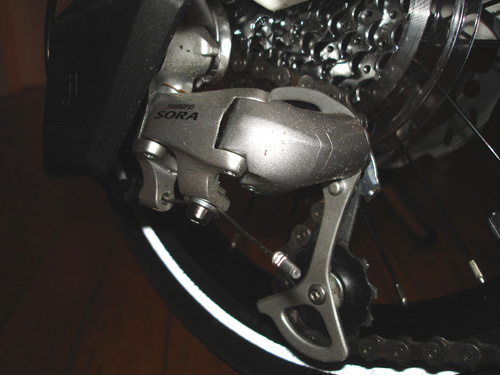 The shifting was flawless…Shimano 9-speed trigger shifter controlling the Sora rear derailleur over a SRAM 9-speed cassette. I had no issues whatsoever with that. 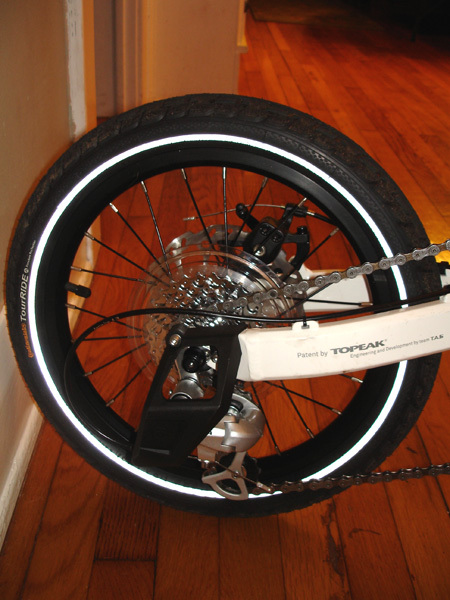 Likewise the brakes — Tektro IO cable-actuated disc brakes, with the front brake equipped with the DiscBlock lock (a hardened steel pin that fits through one of the holes in the disc for casual theft-prevention). The discs performed quite adequately, even in the rain. Disc brakes make a lot of sense on commuter bikes — able to stop reliably in rain, snow and mud and they cut down on expensive rim wear. 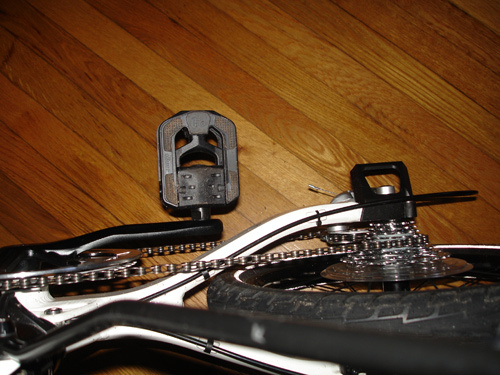 One riding issue I did have with the Flik is heelstrike against the derailleur guard and driveside chainstay. With rather large feet and the short, widely-bowed chainstays of the Flik, I had a tendency to clip the bike with my heel as I pedaled. Careful foot placement as I got used to riding the bike definitely helped, and of course folks with smaller feet shouldn’t have as many troubles with this area as I did. The V9 also comes stock with front and rear lights. The rear light was missing from the loaner I tested, and the front light is…well…fairly ineffective. It isn’t bright enough to navigate by, and may be set too low to provide much “see me” effect for motorists. On some other sites, folks have decried the lack of fenders on this bike — I’ve got to say that not having fenders on this bike is NOT the dealbreaker others make it out to be. After all, those small wheels are so far away from the rider that they couldn’t possibly splash you with muddy water (smirk)! This bike is probably not the first choice for a sloppy, rough-n-tumble rain-soaked commuter anyway — it’s more geared toward someone who needs a small, apartment-friendly machine to get around the city rather than braving the worst Mother Nature can throw at us. 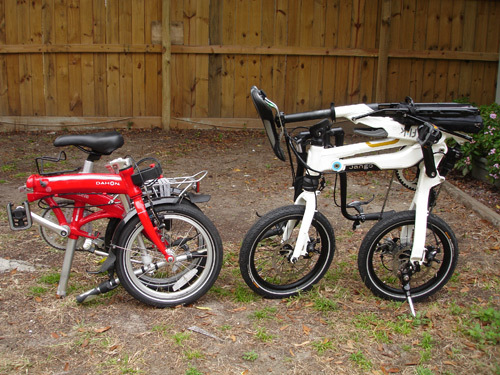 As you can see, the Dahon packs down into a smaller overall package. 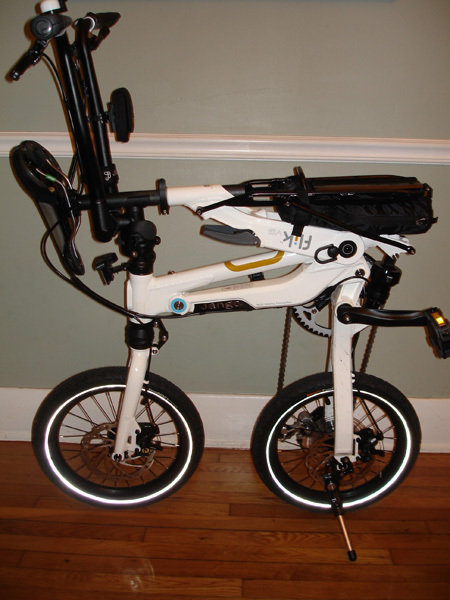 Other Flik users have expressed concern that the folded bike doesn’t fit as easily into small car trunks as other folders, but I was unable to find a small car to test. 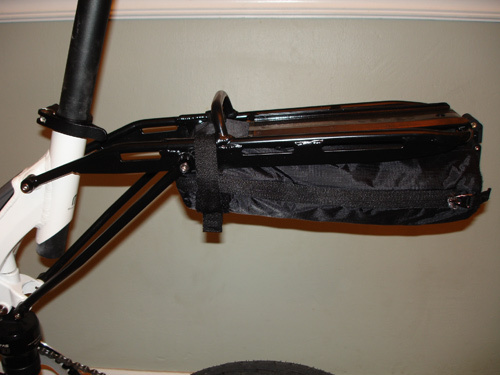 Nor was I able to bring the Flik onto a city bus or train…although I did wheel it into a few stores with no problems and no concerns about bulk. To be honest, I’ll happily sacrifice a little extra size if it means that folding this bike up is so effortless and fast! By the way, I weighed the bike as provided to me — it weighs right at 35 lbs. 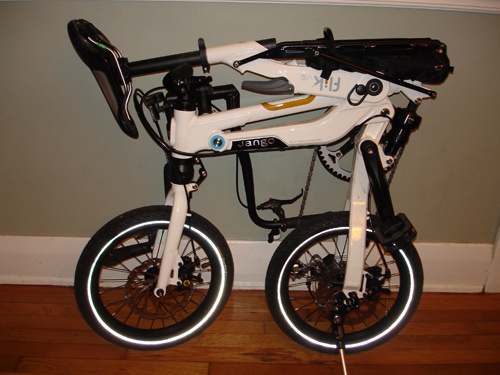 Not the easiest bike to schlep around…luckily it can easily be wheeled around in storage and shuttling modes. So, is this the ultimate folder? The jury’s still out on that — there are so many great folders on the market these days, most of which I have never had the chance to ride. Perhaps my biggest issue with the Flik is price: with an MSRP of around $1500, the Flik is not an inexpensive machine. And, I’m not sure the parts spec on this bike justifies such a price. For about the same price, a base-model Brompton (considered the gold standard in folding bikes) could be had, as could any number of handsomely-appointed folders from Dahon and Bike Friday. I understand that engineering such a unique folder costs quite a bit more, and the technology used to facilitate that folding (cartridge-bearing pivots, camlocks and safety collars) adds to the cost. I’m afraid that some folks will take a look at the mostly-generic parts spec — with a couple of name-brand standouts like the Continental reflective tires, the Avid Speed Dial brake levers, SRAM cassette and Shimano Sora derailleur — and be turned off. It’s a toss-up — does a bike like this NEED high-end parts? I’ll be honest: the low-end and generic stuff sure performed without a hitch. We’d like to thank Jango for giving us the opportunity to try out the Flik — despite its shortcomings (mostly minor), it has definitely encouraged me to add a folder to my personal commuting fleet. 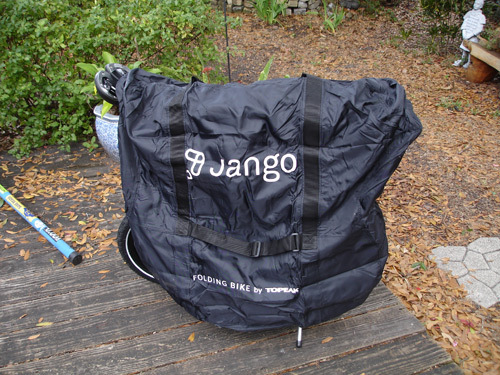 Take a look at Jango’s other models by visiting their site.